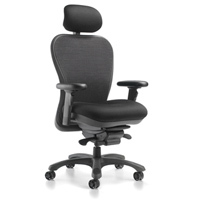 CXO Extreme Comfort Chair, mesh backing to allow air to pass freely, waterfall seat design, lumbar support, 5 prong base with carpet casters, and articulating t-shaped arms. Black Only. Overall dimensions of the chair: 27"-29 1/2" wide, 27"-29 1/2" deep, 36 1/2" - 41" high, seat height 16"-21". WEIGHT CAPACITY 250 LBS. Headrest adjusts up and down with a coat hook built into it's design.